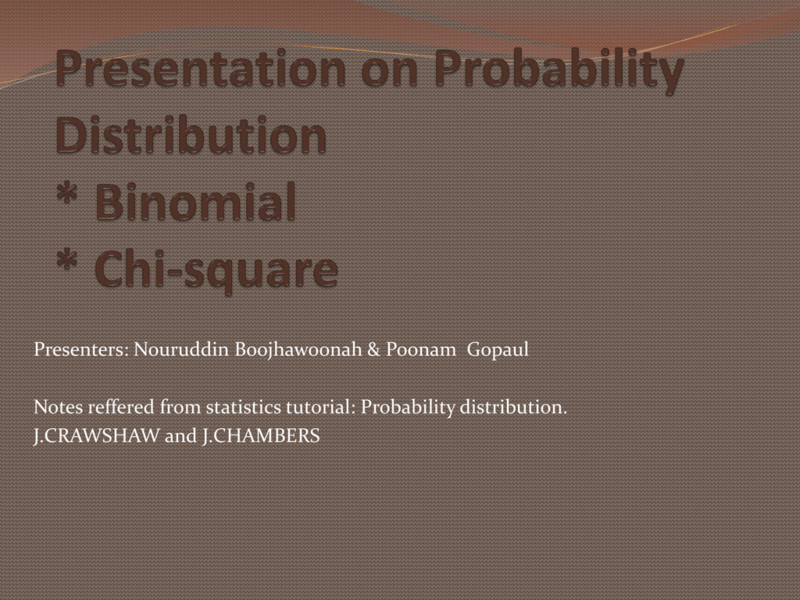 Notes reffered from statistics tutorial: Probability distribution. variables. random variables, and some notation. variable is a random variable. •X represents the random variable X. •P(X) represents the probability of X.
probability that the random variable X is equal to 1.
experiment with its probability of occurence. Consider the coin flip experiment described above. The below table represents the probability distribution of the random variable X .
falls within a specified range. 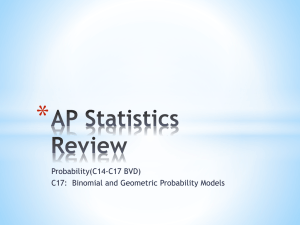 refers to the probability than the random variable X is less than or equal to x. 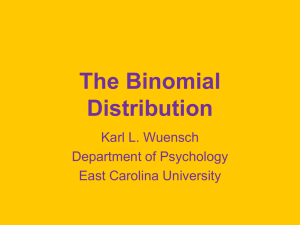 Uniform Distribution. Suppose the random variable X can assume k different values. Suppose a die is tossed. What is the probability that the die will land on 6 ? ask what is the probability that the die will land on a number that is smaller than 5 ? 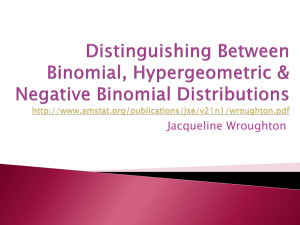 variable; otherwise, it is called a discrete variable. Some examples will clarify the difference between discrete and continuous variables. fighter's weight could take on any value between 150 and 250 pounds. 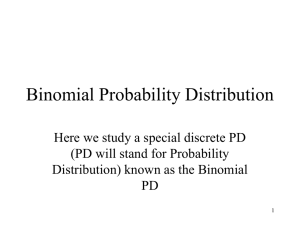 Just like variables, probability distributions can be classified as discrete or continuous. some associated notation; so we cover those topics first. •The experiment consists of n repeated trials. •The probability of success, denoted by P, is the same on every trial. •The trials are independent; that is, the outcome on one trial does not affect the outcome on other trials. •The experiment consists of repeated trials. We flip a coin 2 times. •Each trial can result in just two possible outcomes - heads or tails. •The probability of success is constant - 0.5 on every trial. •x: The number of successes that result from the binomial experiment. 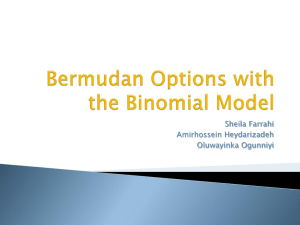 •n: The number of trials in the binomial experiment. 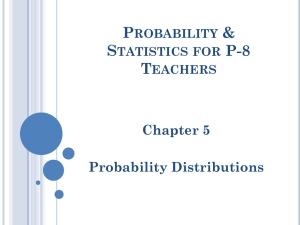 •P: The probability of success on an individual trial. successes, when the probability of success on an individual trial is P.
•nCr: The number of combinations of n things, taken r at a time. the number of heads, which can take on values of 0, 1, or 2. The binomial distribution is presented below. •The mean of the distribution (μx) is equal to n * P .
•The variance (σ x) is n * P * ( 1 - P ). •The standard deviation (σx) is sqrt[ n * P * ( 1 - P ) ]. 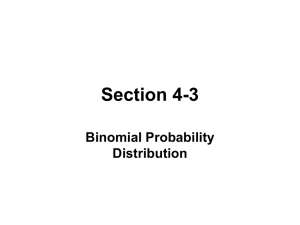 The binomial probability refers to the probability that a binomial experiment results in exactly x successes. of throwing at least four heads. five children there are more boys than girls. (5) X~Bin(4, p) and P(X=4)= 0.0256. Find P(X=2). the probability that it roots successfully is 1/3. 99% certain that at least one cutting root successfully. decide Whether two variables are independent. Calculate the expected frequencies,E according to this hypothesis. must combine them with the next cell. There is one restriction, that the total expected frequency is150. 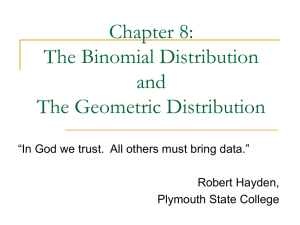 The x2(3) distribution is considered. 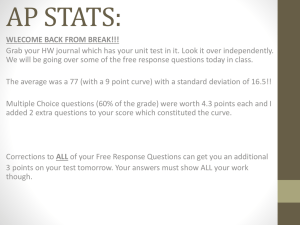  We test at the 5% level and reject H0 if x2> x25% (3),i.e.